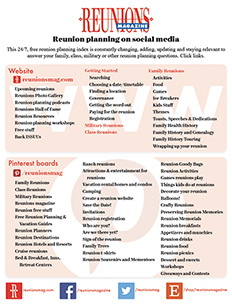 How do I plan the reunion’s “big” meal? Q: I’ve been tasked with planning the “big” meal at our family’s reunion next summer. Because I’m a pretty good cook, everyone assumed that I was the perfect person to be in charge. I know it’s one thing to cook a large family dinner for Thanksgiving or Christmas at home, and another to organize an event at a hotel, where there are professionals doing the cooking and everything is expensive. Where do I start? A: The best place to start is by deciding what sort of meal your family members would like. Do most of your folks want a formal sit-down meal with plated service, where everyone “dresses up” (suits and ties for the gentlemen and dresses for the ladies)? Do you want (and do your attendees want to pay for) a dinner? A luncheon? A breakfast? A barbecue? A themed event? Knowing what sort of event will please everyone will make your planning much, much easier. There’s nothing to compare with a formal event in a hotel ballroom, especially if an important family milestone is being celebrated (a patriarch/matriarch’s birthday, a significant anniversary, or some noteworthy achievement). Many groups elect to hold their “fancy” dinner the final night of their reunion, and many include music, dancing, a talent show, a presentation of the family’s history, or some other entertainment. This will likely be your most expensive option, however. These are some tips to help keep the cost of your meal in line with your budget. A Saturday evening dinner is usually the most expensive option in many hotels. If you can hold your fancy dinner on Sunday evening, the cost usually comes down. As an alternative, consider holding a fancy luncheon (or even a fancy breakfast or brunch) on the final day of the reunion (typically Sunday). When selecting your menu, keep in mind that beef and seafood are more expensive, while pork, chicken, and pasta are less expensive. Ask the hotel’s catering manager what seasonal menu items may be plentiful and less expensive at the time of your reunion–strawberries in June, as an example. As an alternative, there may be nearby restaurants that have private banquet rooms large enough to accommodate your group and offer cost-effective options. Generally speaking, a buffet meal will be slightly more expensive than a similar plated meal because additional cost is incurred by the hotel to prepare food for the buffet which will go uneaten. Perhaps your attendees would rather have something less formal. Many hotels can provide you with less fancy food options, and these are frequently a lot of fun, in addition to being more budget-friendly. For example: an indoor barbecue or picnic; baseball-themed event with hot dogs, sno-cones, and boxes of popcorn; a beach party by the hotel’s pool on a warm summer evening, with fried fish and clams washed down with syrupy blender drinks; a Hawaiian luau; a Mexican fiesta or a German Oktoberfest. And of course, if there is a favorite family dish that has special meaning like Aunt Edna’s special recipe crab dip that everyone raves about, provide the hotel with the recipe in advance so that they can prepare it for you. If a special milestone is being celebrated, a cake is a must. Ask if the hotel can provide this for you. It may be less expensive to purchase the cake from the hotel than to purchase it from a bakery and have to pay the hotel an additional service charge. Another great dessert idea is a “make your own” ice cream sundae bar, which allows everyone to top their sundae just the way they like it. Younger children, in particular, love being able to make their own choices among the various toppings, and everyone appreciates being able to get up from the table to stretch their legs to get their sundaes, especially if there’s a presentation or entertainment scheduled to follow the meal. The good news is that, regardless of the menu you choose, or which meal you decide to make your “big” meal, you’ll be able to relax, enjoy yourself, and join in the reunion festivities, because the hotel or restaurant staff will set up, cook, and clean up for you! Have fun! Previous ArticleWhat are realistic expectations for hotel extras?